The HyTransit project, supported by the FCH JU, started in 2013 and will run through the end of 2018. The project aims at contributing to the commercialisation of hydrogen buses in Europe through the introduction of a fleet of six hybrid fuel cell buses in daily fleet services as well as a hydrogen production and refuelling infrastructure in Aberdeen (Scotland). The aim of the project is to demonstrate that a fuel cell bus is capable of meeting the operational performance of an equivalent diesel bus on demanding inter-city UK routes considerably exceeding its environmental performance. The 6 buses and the hydrogen infrastructure are in operation since the 11th of March 2015. The six buses are operated in Aberdeen by Stagecoach. In addition, 4 fuel cell buses are operated by First Group as part of the High V.LO-City project. The HyTransit and the High V.LO-City projects form the Aberdeen Hydrogen Bus Project, part of the H2 Aberdeen initiative. The 10 buses constitute the largest hydrogen bus fleet in Europe to date. The hydrogen production and refuelling facility, located at Kittybrewster, is also the largest hydrogen facility across the United Kingdom and produces green hydrogen from green electricity. 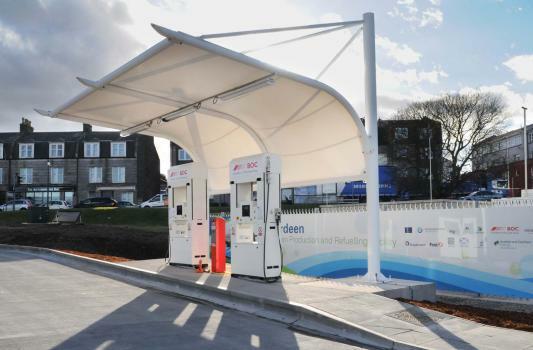 The fuel cell bus deployment is part of the Aberdeen City Region Hydrogen Strategy and Action Plan, a 10-year strategy outlining the key actions required to ensure Aberdeen remains at the forefront of hydrogen technology. 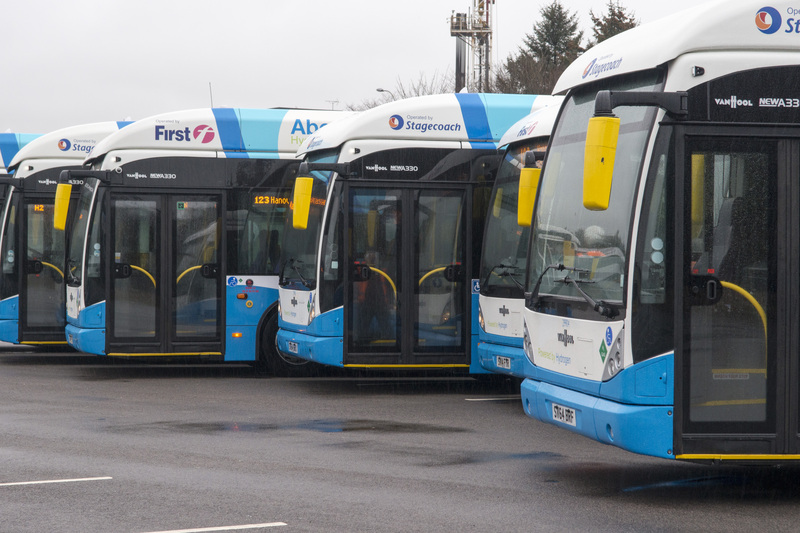 Aberdeen is currently looking at ways to further expand its fuel cell bus fleet. The HyTransit project is funded by the FCH-JU under grand agreement 303467. 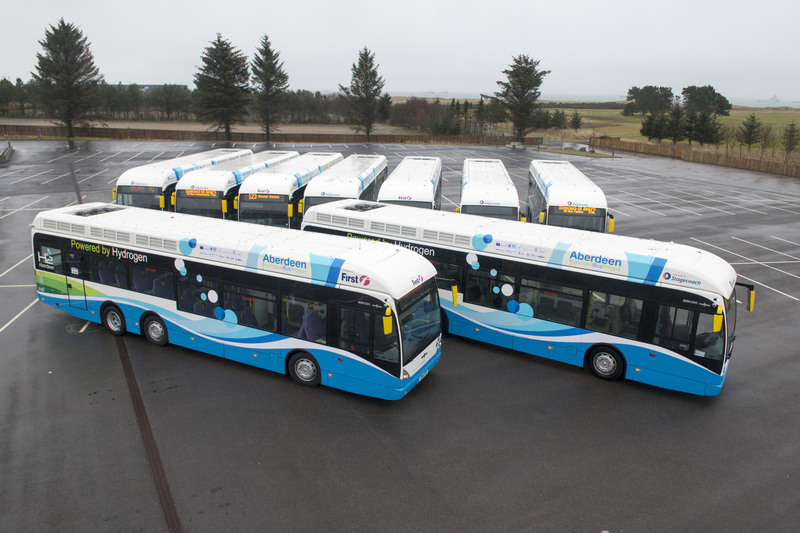 The Aberdeen Hydrogen Bus Project also received funding from the following bodies on the local and national level: Innovate UK, Aberdeen City Council, Stagecoach Holdings Ltd, First Group, Scottish Government, Scottish Enterprise, Scottish Hydro Electric Power Distribution, Scotland Gas Network.